The persistent snake managed to get away with the fish. It just goes to show you never know what life is going to throw your way - or take away from you. 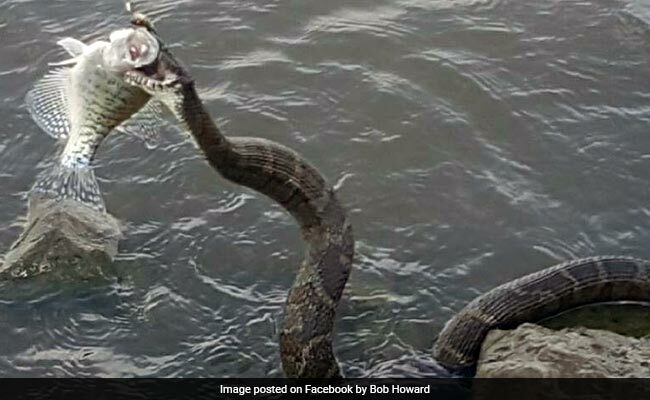 When Bob Howard from Iowa, USA, went fishing, he probably never imagined that an aggressive snake would swim away with his catch. But that's exactly what happened on July 4 when he went fishing at Lake Rathbun in Iowa. Pictures captured by Mr Howard show the exact moment the huge snake latched onto the fish he had caught. "The snake had popped his head up a few times and I hit him... Then I noticed he was going for the stringer of fish I had in the water that I had already caught. I threw a rock and hit him and he swam away," says Mr Howard to NDTV. The battle for the fish, however, was far from over for the persistent snake. "I caught a crappie and as I was reeling him in this snake came out from behind a rock and up out of the water and latched onto the fish," says Mr Howard. "I fought with him for a while," he says, adding that it was during this time that he took out his phone to capture pictures of the snake and the fish. In the end, the snake did manage to get the fish. The pictures of the snake, uploaded by Mr Howard on Facebook, have been shared over a hundred times already and have garnered astonished comments from Facebook users. According to USA Today, Karen Kinkead of the Iowa Department of Natural Resources identified the reptile as a northern water snake - non-venomous but likely to bite if you try to handle it.